Debate over the impact of satellite dishes in Yemen has become heated in recent years. The most virulent opposition to satellite TV programs — which include shows like Baywatch and World Wrestling Federation matches — has come from Islamist groups whose memberships and political muscle have increased dramatically over the past decade (for reasons I won’t go into here.) During my first year of fieldwork in Yafi`a, a rural region of southern Yemen just north of Aden, I consoled several friends whose neighbors’ satellite dishes had been removed quietly under pressure from local “zealots,” or in one case, literally shot off the roof in a barrage of gunfire. A particularly dramatic example of the “reality check” our panel is concerned with; a case in which the virtual influences of global media are violently stymied by angry viewers. The Islamic “public sphere” — a probability of increasing interest among those who inquire into the effects of expanding “new media” technologies on popular, pluralist discussions about Islam. I’d like to contribute to these discussions today by beginning with the premise that media messages mean something to audiences through interpretive “codes” as Hall and others have suggested. As Eickelman notes, the practices of message-reception, or decoding, by audiences in the Islamic world have been far too little studied by scholars. I’ll therefore focus in this paper on a popular debate that is occurring among audiences in Yemen over the moral registers of audio and audiovisual media. This debate is being waged in terms of oral and literate style. In the flood of sound-bites, musical tunes, printed text material, visual images, and transmitting technologies, distinctions between communicative styles are becoming more, not less, salient, as consumers and producers vie for control over the meaning of messages in a rhetorical arena of high political stakes. I’ll examine the debate over oral and literate styles by focusing on one audio-technology in particular: the audiocassette. Where audiocassettes are not only inexpensive but record live sound, they can be tailored to audience tastes far more easily than satellite-TV. Most of my research has focused on the cassette — in particular Yemeni vernacular cassette-poetry — that is widespread in Yemen. As a locus of “text formation,” the cassette provides insight into how local discursive practice informs the use and meaning of media technologies. 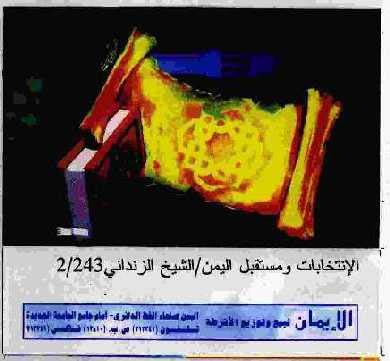 Now, where cassette-texts are easily manipulated by users, they might appear less controversial for Yemenis than the satellite-dish — more “user-friendly”! However, cassettes can be no less immune from heated moral debates, including accusations that they “pour forth corruption on people.” In fact, I argue that cassettes’ facility as recording devices makes them especially subject to controversy. In their sensitivity to local sound-scapes, they can amplify chords that are potentially fractious. Islamist groups in Yemen have been some of the most successful in using cassettes to broadcast messages and expand support bases, especially in rural areas where illiteracy rates are higher. The Islah “Party,” Yemen’s largest and most heteroglot Islamist organization, has surpassed all others in producing engaging and informative cassettes. Since the 1970s, Islah’s spiritual mouthpiece, Shaykh `Abd al-Majid az-Zindaani, has produced hundreds of cassettes that entreat listeners to lessons from the organization’s “scientific institutes.” During a pre-1990, pre-unity era of antagonism between former North and South Yemen, Zindaani regularly used cassettes to lambaste communist ideologues in the South. In post-unity years, Zindaani became confronted with a new task of enfranchising a populace whom he had once berated. This task has been made particularly difficult by the fact that most of Islah’s membership is drawn from northern Yemen. So, in its campaign to win loyalty from Yemenis across the nation, Islam has become extraordinarily proficient in tailoring messages to regional audiences. Islah’s task in this regard is particularly difficult given the diversity of audience tastes in Yemen, a diversity fueled by what is probably the most vibrant grass-roots recording industry in the Middle East. The political director of Islah, Muhammad Qahtan, explained to me that with the proliferation of popular music and alternative sources of media entertainment, fewer Yemeni cassette-fans have patience for old-style sermons; especially younger men and women, who constitute the bulk of new Islah members. “On the other hand,” he confided, “we’ve noticed that an interest in folk and traditional songs (turaath) has been growing in recent years.” He then cited a few song genres that, not incidentally, are especially popular in southern regions — precisely the areas in which Islah has been focusing its campaigns. These genres included hiwaariyaat — a playful, flirtatious banter exchanged between a male and a female singer — and also sung political folk-poems released by the musicians whose cassettes I’ve been following in southern Yemen. Evidence from Islah’s cassettes confirms the organization’s attention to a broad range of poetic genres, many of them regionally stylized. The most successful releases regularly pair the speeches of Zindaani and other Islahi orators within a motley assortment of creative song and verbal genres. While I don’t have time to go into the variety of poetic and musical genres, I’ll simply say that these include: religious songs adapted to pop-hit melodies and re-titled “anthems”; tribal chants traditionally used to rouse spirits of highland audiences; and mock colloquial dialogues between “typical citizens” that serve to reinforce what Islahi speakers have just said, but in a common sense, street-smart fashion. Now, for those of us keen to the leaking boundaries of Islamism, tribalism, nationalism, partyism, and so forth, Islah’s cassettes are nothing short of a Golden Calf. The blurring of discursive boundaries, however, is of interest not solely to political theorists. In Yemen, such blurring on cassettes is causing heated debates over the foundations not simply of a public sphere marked by the typical terms of civil society, democracy, and pluralism — but specifically, of an Islamic public sphere, one that is as morally just and true as it is inclusive. Like az-Zindaani of the Islah party, Muqbil al-Waada`i, the Salafis’ most outspoken leader, has attracted a wide following through his frequent release of cassettes. Less concerned with political gains, however, al-Waada`i’s cassettes are more sober in tone, and typically feature his sermons recorded live on Friday afternoons from his pulpit. One of al-Waada`i’s accusations against Islah is that the organization turns Islam into “pop-song” (fann). In particular, al-Waada`i derides Islah’s creative use of anthems to couch its messages to popular audiences. Even more maligned is Islah’s use of musical instruments, which have been occasionally disparaged by conservatives throughout Islamic history. In a popular arena of mass-produced sound-bites in which debates over doctrine and political orientation are waged in registers of style, persuasion, and entertainment, the aesthetics of sound has become an especially hot topic. Islah’s reactions to such charges of “invention” are managed in both subtle and heavy-handed ways. On one cassette, az-Zindaani speaks to listeners up-front about the authority that can accrue to those who listen carefully, to his cassettes or any other aural medium. “He who listens to this microphone amplifier can reveal to us how we use it, and how we fix it if it stops. It is the same for whoever listens to… a car. And everyone who really listens to the audible world: he is the companion of truth in his orientation, and his statements, and his explanations. All humans accept this for every listener.” Moral authority rests not in producers’ styles of oratory, Zindaani asserts, but rather with each and every listener. Whether a message is chanted or recited or sung to musical accompaniment, the good listener has the innate ability to hear the truth. Other messages vouchsafing the moral virtue of song are more explicit. Anthems and songs can mollify listeners by explicitly focusing on the place of pop-song in religious devotion. In the opening segments of one cassette, a chorus repeats the refrain: “I’m enraptured with song, not for song’s sake, but for the sake of those who listen!”; and later, somewhat cryptically “I have turned song into my stairway to our candle-lit destination.” Alternatively, cassettes featuring sung anthems can invoke a series of textual frames that index a literate tradition of learning. Such cassettes can begin, for example, with the traditional recitation of a chapter from the Qur’an that frames the contents within an orthodox tone of piety. Similarly, an opening traditional sermon that frequently cites verses from the Qur’an and other key Islamic texts can foreground attachment to spheres of literate knowledge. As Islah asserts its adherence to the true path, some of the most prominent frames levied against the thick and thin of heteroglot oral invention are visual. [SHOW CASSETTE.] 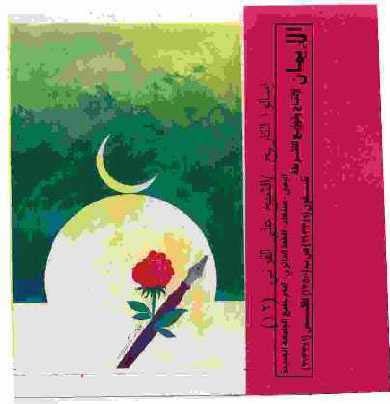 On what is certainly the most creative collection of songs I’ve heard released by Islah — a cassette called “Yemen’s New Dawn” — the front of side A reads in large letters: “Religion is convention (ittibaa`), not invention (ibtidaa`).” (Here it is, in a wonderful green color.) 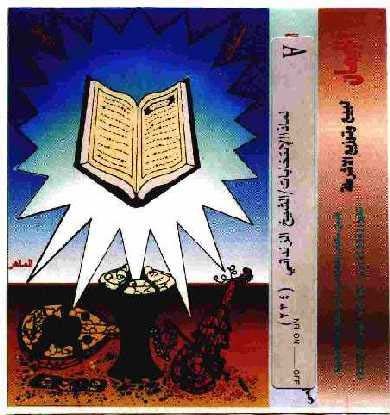 Other cassettes feature such messages as: “In the summons to God’s righteous path, the Islamic cassette is a superb means”, or “May God grant blessings on whomever helps disseminate this cassette.” The messages on Islah’s jacket-covers, however, are perhaps the most telling of all. The imagery on these covers released by Islah is startlingly consistent: on 80% of cassettes that I have purchased, the central mantlepiece of the cover features imagery of the Book or of writing. Such imagery seems to have grown more prominent, in fact, precisely as Islah’s cassettes are increasingly tailored to the aesthetic preferences of popular audiences. Just as the markedly literate textual genres on cassettes frame orally inventive material, so these visual symbols of literate Islam are meant to frame each cassette within a history of orthodox literate practice that carries considerable discursive weight. Clearly, however, the success by which such frames contain their cacophonous material is up for debate. In Habermas’s conception of the “public sphere,” the keystone that cements a conditionally new mode of discourse is the open-ended communication between individuals who are uninhibited by status or power. Habermas’s model of public discourse remains as analytically insightful as it is socioculturally problematic. In Yemen, public discourses are — to be sure — directly linked to the spread of media technologies that facilitate the participation of an increasingly numerous and diverse citizenship. However, where such technologies are not only amplifiers of discussion but are conduits to and from centers of trans-local cultural and economic production, their mediation of public discourse is always politically fraught. For some Yemeni Islamists, satellite-TV is destroying rather than creating a potentially “global village” of civic-minded inhabitants; its oral and visual material must be countered with photocopied texts distributed among literate university students. For others, audiocassettes are being misused to the boon of a pop-music lumpenproletariat whose ears seduce them into distorting Islamic principles. I would submit that the dilemma facing the Yemeni Islah organization — that is, how to promote popular Islamic audio-recordings without losing touch with learned, literate Islam — is an increasingly common one not only for Islamist movements, but for Muslims in general. The old question of how modes of orality and literacy are to be managed within the compass of Islamic communicative practice will remain a compelling moral issue, especially in the flood of sound-bites, images, and readable material that is reaching mass markets. I would argue that McLuhan’s medium-message homology will only become more salient for Muslims as media networks diversify. Ultimately, however — and here is the catch — if an Islamic public sphere is to be “virtual” at all, it must be accessible through the textual conventions surrounding THE Book. As I have shown by examining audiocassettes in Yemen, oral “invention” renders the mediation of Book-ish “convention” even more essential to creating a true and truly public Islamic sphere. Ironically, Book-ish convention is becoming as much a semiotics of oral and visual register as it is of literate practice. This entry was posted on September 6, 2008 at 6:11 pm	and is filed under Music Tapes. Tagged: education, Yemen. You can follow any responses to this entry through the RSS 2.0 feed. You can leave a response, or trackback from your own site.